Home » VectorVest » Buy Restaurant Group #RTN says Vectorvest. A clear investment case given the growth in earnings and free cash flow. 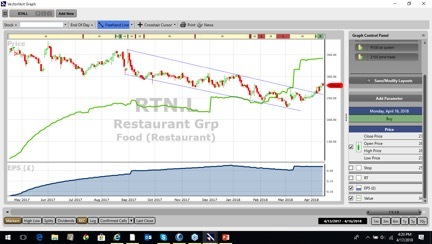 Buy Restaurant Group #RTN says Vectorvest. A clear investment case given the growth in earnings and free cash flow. By Alan Green in VectorVest on 18th April 2018 . London based Restaurant Group (RTN.L) currently operates 498 restaurants and pub restaurants throughout the UK. Its principal trading brands are Frankie & Benny’s, Chiquito, Coast to Coast and Brunning & Price. It also operates a multi-brand Concessions business, which trades principally in UK airports. The GRT (Earnings Growth Rate) is a key VectorVest metric that frequently flags up a change in fortunes, often before any official announcement from the company itself. The GRT for RTN moved into positive territory during January 2018, and has continued climbing higher all the way through to today’s GRT rating of 19%, which VectorVest considers to be very good. Although the RS (Relative Safety) metric only registers a fair rating of 0.97 (scale of 0.00 to 2.00), at 279p RTN trades well below the current VectorVest valuation of 342p per share. The chart of RTN.L is shown above in my normal format. Earnings per share (EPS) has doubled over the past year and the share has moved from overvalued to undervalued in this period. Technically the share has broken out of a downsloping channel and also charted a double bottom on a much longer term view (not shown). The share is on a VectorVest buy signal. 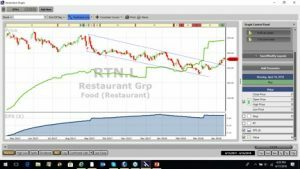 Summary: A well-run restaurant business can be a real cash cow, and in the case of RTN the costs savings and operational streamlining from the management team during 2017 really do seem now to be delivering results. Although the fair RS rating tends to push RTN into the domain of the more adventurous investor, given the growth in the rate of earnings and free cash flow, VectorVest believes a clear investment case now exists for this London based group. Buy. Readers can examine trading opportunities on RTN and a host of other similar stocks for a single payment of £5.95. This gives access to the VectorVest Risk Free 30-day trial, where members enjoy unlimited access to VectorVest UK & U.S., plus VectorVest University for on-demand strategies and training. Link here to view.